Ferndale James Hardie Siding | Ferndale James Hardie | Ferndale James Hardy Siding | Ferndale James Hardie Fiber Cement Siding | Ferndale Fiber Cement SidingMcGlinch & Sons CO.
McGlinch & Sons has been serving James Hardie Siding to their customers all over the Greater Detroit Metropolitan Area and Southern Michigan since 1917! We have been able to successfully deliver the James Hardy Siding for many years and plan to continue to do just that. McGlinch & Sons has always been a trusted and successful family-owned business that is unique in its own being and that offers customers four generations of skills and knowledge. One of the main reasons that our customers continue to use our services is because of our outstanding customer service that has been in effect for 97 years. At McGlinch & Sons we are proud to offer our James Hardie Siding with all facets of exterior construction. The James Hardie brand brings an overall beauty to your home, as well as safety and vigor and will increase the value of your home too. James Hardie is known to be the Nation’s #1 Brand of Siding. The James Hardie Fiber Cement Siding is resistant to all types of weather conditions and is low-maintenance. As a result of the James Hardie Siding our customers are more likely to get in contact with McGlinch & Sons for services. Ferndale, Michigan has about 20,000 citizens residing there and is located in Oakland County. McGlinch & Sons is located in Farmington Hills, which happens to be located just 14 miles from Ferndale. We’ve found out that our Ferndale homeowners prefer James Hardie Siding products over any other company and that alone is why we are well known in the Detroit area. One of the reasons being that we know how to protect the homes of our Ferndale customers from all sorts of weather problems. McGlinch & Sons products will help safeguard their homes from all kinds of severe climates that Ferndale may end up getting at some point in the year. McGlinch & Sons’ James Hardie Fiber Cement Siding comes in a nice range of styles and textures that will go along with any of our customers’ needs and go right along with the exteriors of their homes. On the plus side James Hardie Siding is absolutely hurricane resistant and as we all know Michigan gets severe windstorms, hailstorms and tornadoes, but fortunately we do not get any hurricanes. 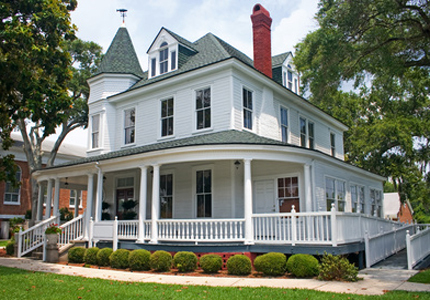 Furthermore, McGlinch & Sons’ James Hardie Siding is so much better than both vinyl and wood siding products combined! James Hardie Siding is also not flammable, fade-resistant and even weather-resistant. Once you get the James Hardie installed, it puts an end to moisture form rain, snow and humidity. Also, its impact-resistance against debris caused by hail and wind! James Hardie Fiber Cement Siding is recommended by building codes for homes built in areas of being prone to hurricanes, tornados and wildfires. So if you’re interested to learn more about McGlinch & Sons, just give us a call at: (248) 987-6300, for our various products and services. Let James Hardie Siding cover your beautiful home today!